Antigua & Barbuda Humane Society operates Antigua's Donkey Sanctuary which is home to approximately 150 rescued donkeys. When left to roam in search of food and water, these animals are often destructive and find themselves in serious trouble. They devastate farmer's crops, break water standpipes, destroy irrigation lines and fences and pose a serious danger on the roads. Once housed at the sanctuary, they will spend the rest of their lives there in safety. The island of Antigua is experiencing a severe drought this year which is having a major impact on the entire animal population. Farmers are losing animals every day. We were in fear of losing some of our precious donkeys because the guinea grass that they are fed was becoming sparse and would no longer be available. 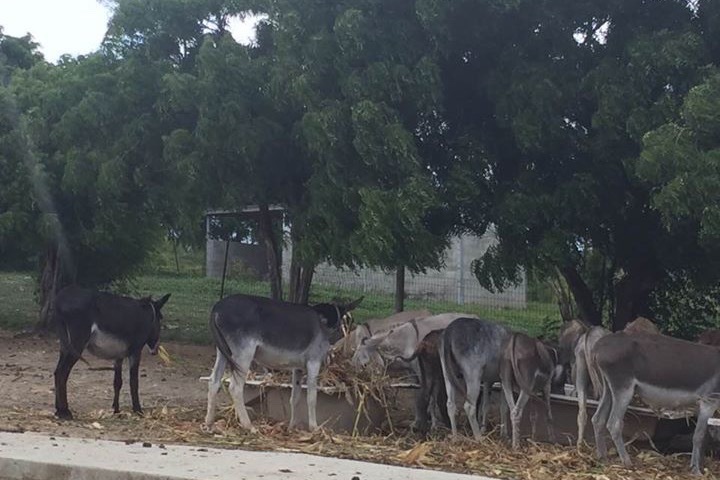 The Sanctuary had to act quickly and with the help of a friend in the U.S., we created a Go Fund Me Campaign to try to raise the funds necessary to purchase a 40-foot container of Bermuda coastal grass hay and wheat straw for the donkeys. The shipment cost just over US$10,000 which we were able to raise very quickly thanks to our generous supporters. Through the monies raised via the Go Fund Me campaign, we were able to mitigate the severe effects of the drought and save the donkeys. We could not have accomplished this without your generous contributions and unwavering support. Thank you so much for coming to our aid during this crisis. It will take a long while for the guinea grass to grow enough to provide food for the donkeys. This shipment will ensure that they have enough to eat until that time. Below are some images of this journey.